Wild Moon is run by founder Caroline Martin with help from her mentors Judy and Allen Hasty. Wild Moon Flowers is a small, one-woman flower farm and floral design studio located in Santa Cruz. Caroline Martin started Wild Moon Flowers in 2018, three years after completing the UCSC Farm and Garden apprenticeship program where she gained horticultural training and a passion for flowers. Wild Moon Flowers currently leases organically certified land from Yellow Wall Farm on Ocean Street Extension, in the heart of Santa Cruz. Judy and Allen Hasty, the property owners and Yellow Wall Farm founders, have been farming this land organically for over 15 years. Wild Moon Flowers is committed to growing organic, local flowers to help combat the environmental and health hazards of the global flower industry. 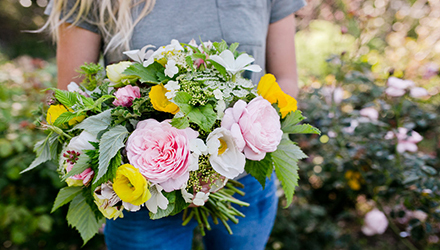 In addition to selling at the farmers market, Wild Moon Flowers offers weekly flower subscriptions and event florals. Crop rotation, cover cropping and constant gopher trapping. Wild Moon uses drip irrigation during the early morning or late evening so conserve water. Hand weeding and hoeing .